SKI IN / SKI OUT MAISON PERSONNALISÉE. C'est un bijou unique situé sur la piste Stagecoach dans Heavenly Valley. Ce n'est que pour une seule famille ski in / ski out, à Tahoe Village !. Heavenly Valley est la plus grande station de ski en Amérique du Nord. La diligence (passage intermédiaire) est le meilleur point d'accès aux parcours de double diamant tels que Mott's, Milkyway, North Bowl et bien d'autres. D'autres annoncent Ski in / Ski out, mais aucun autre n'est plus proche que nous. Notre porte d'entrée est à 25 'de la course. Vraiment un endroit incroyable pour ces passionnés de montagne! Nous avons acheté le Lodge en août 2010 et nous l'avons rénové et réaménagé. Nous nous occupons de toutes les réservations, ainsi que des arrivées et des départs nous-mêmes et nous nous efforcerons de rendre votre séjour 100% agréable et nous nous réjouissons de vos voyages de retour. Le Lodge offre une vue magnifique sur l'ascenseur, la vallée de Carson et bien sûr les montagnes et les domaines skiables. Comme nous sommes situés sur l'ascenseur principal, les routes sont dégagées et ne posent généralement aucun problème. Le garage 2 voitures détaché a des supports de conseil et de l'espace pour tout l'équipement de ski aussi bien. Il est très pratique de quitter la piste et de changer dans le garage en laissant tout votre équipement le lendemain. Le Lodge lui-même est sur 3 niveaux et a des plafonds à poutres, planchers de chêne, murs de pierre, 2 poêles à gaz, une grande salle englobant la cuisine, salon et table à manger formelle pouvant accueillir confortablement 16. Une véranda fermée spacieuse avec des vues incroyables et des fauteuils de massage confortables. La salle familiale est dotée de murs en cèdre, d'une merveilleuse table de billard Brunswick, d'une télévision à grand écran, d'un bar en cèdre de 20 'de long avec un évier, et vous pouvez vous y référer. Les chambres ont toutes vue et sont joliment meublées pour votre confort. Les chambres du 1er niveau partagent une salle de bain dans l'une des chambres. 2 chambres, cuisine, salle de bain unité individuelle sur le garage dort supplémentaire 4 si nécessaire pour des frais supplémentaires de 150 $. 00 par nuit (voir vrbo # 316731). Nous vous remercions d'avoir regardé notre site et espérons être à votre service. Salle n ° 5 est dans la maison d'hôtes si loué avec la maison principale seulement. Wonderful home, extremely well equipped kitchen, with every possible cooking need provided. Great proximity to Stagecoach lifts. Home was spotlessly clean and neat. Would not hesitate to stay again next year. A few minor items; a few more towels needed(each female needs two),only one pool cue had a usable tip, if you stay in the upstairs bedroom be prepared for 71 stair steps from garage to your bedroom. Overall a great stay for our family of twelve and two infants. The House across the streeet from the lift. Seventeen of us found ample space to relax with plenty of bed space for all. We rented the House, Servant quarters, and Guest House over the garage for a very reasonable price. The Stagecoach lift is within 4 minutes from the front door. That included walking across the street in ski boots climbing up the snow, putting on skies, and casually skiing down and having a seat on the chair. I timed it. The house, with a table that sat all 17 of us, was comfortable and made everybody feel at home. The house does have stairs that must be climbed but those stairs also provide for a view of the Stagecoach area. We ended leaving our shoes in the garage or the enclosed stairs, after boot up. We ate lunch at the house instead of on the mountain. It is very hard to find a house of this sort anywhere near ski in and ski out. The owner, Bob, was very helpful and accommodated all of our needs. 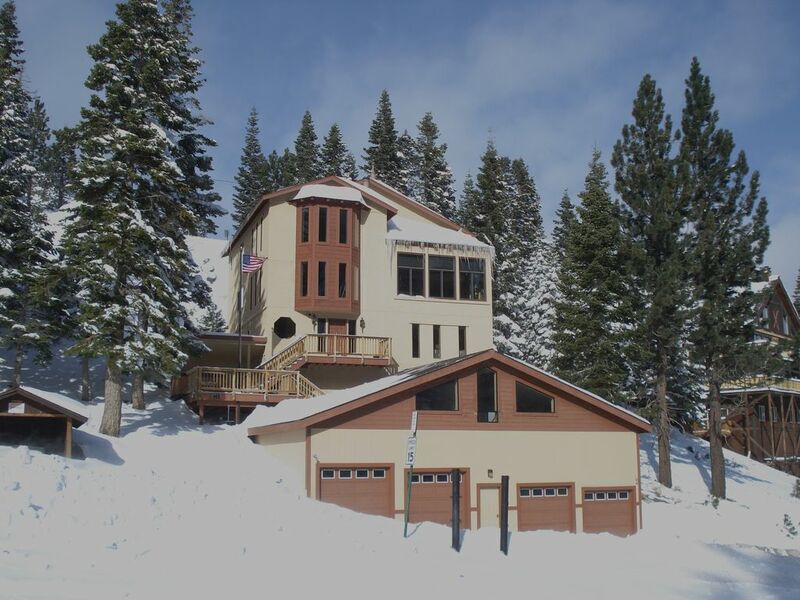 The house is in the perfect location, it is right off the slopes of heavenly. There is plenty of room and separate areas to hang out. We had a great time and dealing with Robert was super easy. We will be back again soon. Thank you so much for the kind review. I am very, very happy that you enjoyed your stay and found the house to your satisfaction. Hope to be able to host your group again. You were great guests! This multi-level house is great for families. It is spacious, with lots of room for everyone. Be prepared to climb stairs, but well worth it for the view and the privacy. We made Thanksgiving dinner in the large, well-equipped kitchen without lacking for anything. Great location and the owner was very helpful to us. This house is the perfect size for large groups. We had 20 girls that fit comfortably in the house and guest house. The Dining room table is awesome for large groups as well. All the beds were extremely comfortable, couches were like clouds and the place was kept up very well. Also, enough parking for 4 cars in the garage and two lots on either side. We only had two complaints- we didn't realize how many flights of stairs there were from the garage to the house. Not a huge deal but when you have coolers with food, alcohol and suitcases for 20 women- needless to say it was a trek! Also- the Shuttle is not specifically at the front door. It stated that in the book and we actually missed an appointment bc of that. You have to walk down to the Stagecoach chairlift to catch it. Other than that we had a wonderful time! I would go back in a heart beat! The interior quality of this home is outstanding. It's everything the pictures represent, and we had a great family reunion here. Very nice bar and pool table room for evening socializing, and a nice, large kitchen/dining area that accommodates a large group well. The only cautions are limited parking, lots of stairs, and the layout of the bathrooms. If you only have 10-15 young visitors none of these will matter. If you have the max at 21 or 22 visitors, and any are elderly, all will be a concern. Not at all a deal-killer, but be prepared to park down at the lift and walk up to the property. And with that many residents, bathroom logistics are a bit of a challenge with only one real community bathroom and the rest that you have to access through private bedrooms. But it's truly everything it was represented to be, and the quality of the home is outstanding. We had a very nice stay, and appreciate the use of this very nice home. Cette propriété définit sur la tête de piste de la renommée mondiale Tahoe Rim Trail et sur le côté du Nevada de Heavenly Valley, un des Amériques du Nord plus grandes stations de ski.